Reservations for Mango Season's "A Night of Bossa Nova" may be made online at www.hprtickets.org or by calling the station (955-8821) during regular business hours. Tickets are $30 general, $25 for HPR members, and $15 for students with ID; service fees are applied to online orders. The Atherton Studio is located at Hawaiʻi Public Radio, 738 Kāheka Street. Doors open a half hour before the performance. Advance ticket purchase strongly encouraged as the house is frequently sold out before the performance date. Mango Season originated as the husband and wife duo of Curtis (vocals/guitar) and Annie (vocals/percussion) Kamiya performing acoustic Hawaiian folk music on the streets and in the dive bars of Chinatown. 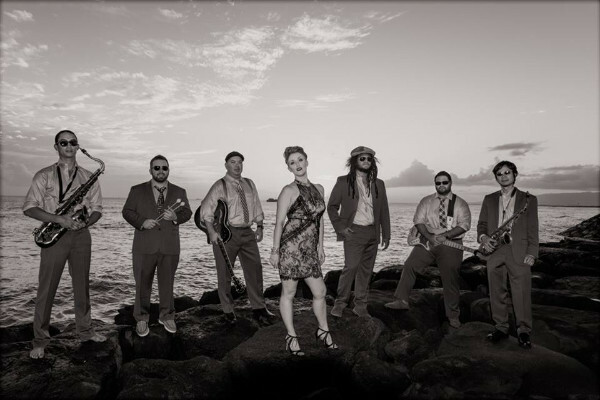 Evolving their sound to incorporate vintage soul, jazz-infused harmonies and a funk groove, the members now draw their inspiration from music as diverse as old school ’70’s funk/soul (Earth, Wind & Fire), with hints of world jazz (Pink Martini) and contemporary Hawaiian sizzle (Kalapana). Along with the Kamiyas, band members are Wil Tafolo (vocals/bass), Mark Lindberg (drums), Ken Lykes (keyboard), Nicholas Kaleikini (tenor sax), Chris Yeh (alto sax). For their July 22nd show in the Atherton, Mango Season’s seven piece band will be joined on stage by percussionist John Porlas and Sandy Tsukiyama, host of HPR’s "Brazilian Experience." WHEN: Saturday, July 22, 7:30 p.m. The Atherton Studio seats 75 people and is home to a magnificent Bösendorfer concert grand piano. The Studio is available for rent for musical performances, community group meetings, recordings, and lectures. It is located in the HPR office and studio complex at 738 Kāheka Street, across from the Honolulu Don Quijote. Metered street parking is available, as are paid lots at the First Hawaiian Bank (Kapiʻolani branch) and in the Pan Am building. Select Atherton Season concerts air on the HPR-produced program Applause in a Small Room, Sundays at 4 p.m. on HPR-1. Bonnie Rice and The Rice Partnership, Wealth Management, are the exclusive sponsors of the Atherton Concert Series. HPR is a private, non-profit organization that broadcasts classical, jazz, and international music; and in-depth news and informational programming from National Public Radio, American Public Media, Public Radio International, and other local, national, and international program sources, as well as programs produced by Hawai‘i Public Radio. In October 2016, Charity Navigator, the premier charity evaluator, awarded HPR its fifth consecutive four-star rating for exceptional fiscal management and commitment to accountability and transparency. HPR was named one of the 2015 Best Places to Work in Hawaii by Hawaii Business magazine and Best Places Group. HPR was also recognized in November 2015 with the Cades Schutte-The Cades Foundation Nonprofit Business Leadership Award, as part of Pacific Business News' Business Leadership Hawaii Awards. In 2016, the station won its third national Edward R. Murrow Awards for its news coverage of the Thirty Meter Telescope. HPR’s mission is to serve the entire population of the state of Hawai‘i with two excellent program streams. HPR-1 broadcasts news, talk, entertainment, jazz, blues, and world music. Its FM frequencies on O‘ahu (KHPR 88.1, K203EL 88.5); Maui, Moloka‘i, and Lāna‘i (KKUA 90.7); Hawai‘i island (KANO 89.1, KHPH 88.7, KKUA 90.7, K235CN 94.9, K239BV 95.7); and Kauaʻi (KHPR 88.1 and KIPL/KIPL-FM 89.9). HPR-2, "your home for classical music" is found on Oʻahu (KIPO 89.3, K264BL 100.7); Maui, Moloka‘i, Lāna‘i (KIPM 89.7, plus KIPH 88.3 in Hana); Hawai‘i island (KIPH 88.3, KIPM 89.7, KAHU 91.3, and K283CR 104.5) and Kaua‘i (KIPO 89.3; K269GD 101.7). HPR is online and streaming at hawaiipublicradio.org; as well as on Facebook (FB/hawaiipublicradio), Twitter, Instagram, and other social media platforms (@WeAreHPR™). Free iOS and Android™ apps for “Hawaii Public Radio” are available for download from the App Store or Google Play™. HPR-1 and HPR-2 may also be heard via cable broadcasts from Oceanic Time Warner (channels 864 and 865) or Hawaiian Telcom TV (channels 661 and 662). PIX attached (high resolution version available upon request): Mango Season, (l. to r.) Nicholas Kaleikini, Mark Lindberg, Curtis Kamiya, Annie Kamiya, Ken Lykes, Wil Tafolo, Chris Yeh. PHOTO CREDIT: Rita Courey. In our print communications, HPR takes special care to include the ʻokina (glottal stop) and kahakō (macron) marks used in the proper spelling of Hawaiian words. Due to compatibility issues with certain Web browsers and/or search engines these marks may not display correctly.